The services offered by the software are only accessible on our website at www.orderhive.com and app.orderhive.com. 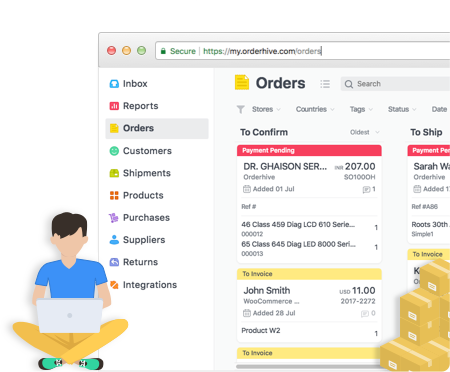 1.2 You will provide Orderhive with all information wisely requested by it in order to enable full use of the software. 2.1 Orderhive will provide you with an acknowledgment on successful registration. 2.3 You agree to notify us immediately in occurrence that you suspect misuse, loss of username and password. With your notification, Orderhive will issue a new user name and password. Until such allocation, you are responsible for the consequences of any use of your username and password. 3.1 Upon confirmation of registration with Orderhive, you shall be provided a 15-day free trial period (excluding net usage charge or any third party cost) to use services offered by the software. 3.2 After the completion of the 15-day free trial, if you wish to continue the services you can upgrade to any of the plans offered by Orderhive. For further assistance, regarding the upgrade, feel free to contact our customer support and they will be delighted to help you out. 5.1 You can cancel your subscription from the Billing page in your Orderhive account. If you choose to cancel the subscription before the end of your current paid up month, the cancellation will take effect immediately and you will not be charged again. Your data won’t be deleted from the account until you notify us through email or call. 5.3 Orderhive has the right to suspend or terminate your account and current or future use of service due to any reason. Termination or suspension will result in deletion of your account. 6.1 Orderhive reserves the right to change, delete or discontinue any service feature, temporarily or permanently without notice. 6.2 Orderhive reserves the right to modify monthly subscription prices at anytime without prior notice. Support is available on our website. In event if you are unable, using information, to resolve an issue arising in the use of the software within reasonable period, please contact us swiftly by way of email at [email protected] or call us on +1-888-878-5538.